It's that time of year again! Please donate to the Stamp Out Hunger food drive. Photo by Jason Taellious. Lots of things are happening on or near the Hill on Saturday. Here’s a quick list. Remember, you can check our Events Calendar anytime to see what’s up. Rainier Valley Cooperative Preschool is hosting a Rummage Sale from 9:00 am until 2:00 pm, at 3818 South Angeline Street in Columbia City. The Blaine Memorial United Methodist Church Asian Craft Fair is from 10:00 AM – 4:00 PM. 3001 24th Avenue South. The School of Acrobatics & New Circus Arts (SANCA) Annual Spring Showcase has two performances on Saturday at the Rainier Valley Cultural Center, 3515 S Alaska Street. Choose between the 2:00 pm and 7:00 pm shows – or go to both! The Stamp Out Hunger food drive is also on Saturday. It’s probably the easiest food drive there is — just place bags filled with non-perishable food items next to your mailbox or mail slot. 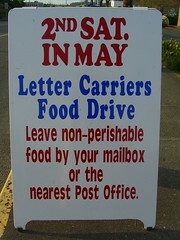 Your letter carrier will pick them up and deliver them to local food banks! Coyotes have been seen in many parts of Seattle, including North Beacon Hill. Photo by emdot. The folks at the School of Acrobatics & New Circus Arts just down the hill in Georgetown will be holding their Annual Spring Showcase on Saturday, May 9, at the Rainier Valley Cultural Center. They tell us the show will feature “Two unique, circus-variety shows featuring the spectacular SANCA Youth Company, the amazing Circus 1-ders, incredible SANCA instructors and fabulous friends of SANCA!” See their website for further info. That same day from 9:00am – 2:00pm, Rainier Valley Cooperative Preschool is hosting a fundraising rummage sale at 3818 S Angeline Street in Columbia City. See this and other upcoming events on our events page. 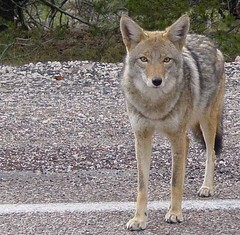 David Gackenbach reported on the Beacon Hill Mailing List this weekend that a trio of coyotes were “loping down the sidewalk” at 18th and Plum on Saturday night. Keep an eye on your pets and keep them safe.